Although I love to photograph the Alps — it’s a stunningly beautiful place — it can be frustrating because finding the perfect view is difficult. It can be harder than you might imagine to capture that kind of natural majesty. January 2017, single image, additional exposures for highlights, focal length 24mm, aperture f/11, shutter speed 30 seconds, ISO 80, tripod. As soon as we arrived at Selva Val Gardena, I began exploring the village’s hiking trails to find the best view of the city and the mountains. This was a family vacation, but I couldn’t resist photographing the village. This is one of my favorite spots in Selva Val Gardena — it’s a place where the ski slopes and the road seem to converge, forming a dramatic angle in the photograph. There is energy in this photograph that I like — the dynamic convergence of the two roads, as well as the three cliffs in the background that overlook the slopes. There’s the suggestion of something menacing about those cliffs, perhaps a warning of the mountain and its dangers. Once again, I found a spot overlooking the village and set up my tripod. 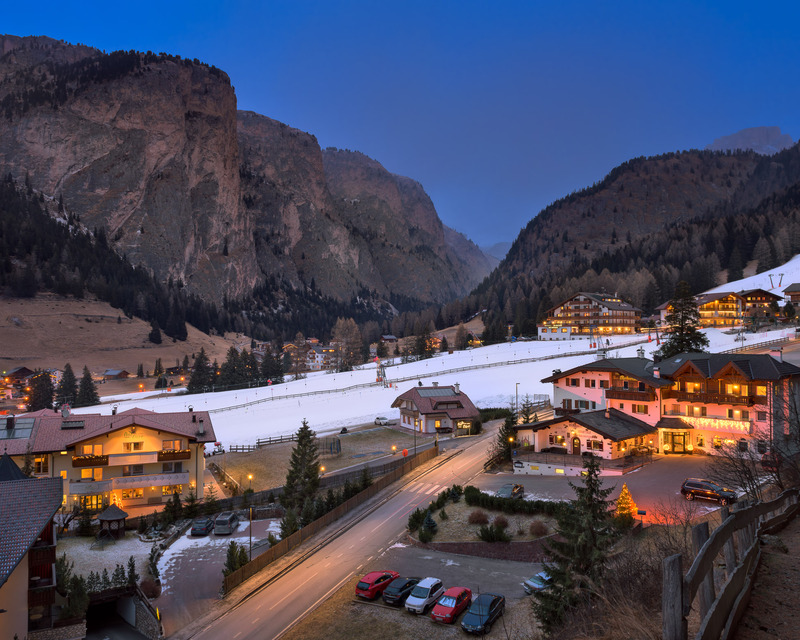 Even though the snow on the slopes was artificial and the cliffs gave a somewhat sinister cast to the scene, I liked it nonetheless — an Alpine village in the early hours of evening.